• Each team scored in the third period and Austin Czarnik netted the only goal of the shootout. (That’s a CCHA-only thing, East Coasters.) It was a tight game between a pair of conference rivals that will meet again Saturday and in their next game after that, Dec. 28 in the opening round of the Three Rivers Classic. • These teams play for the Ohio Cup. I love that. The MU and OSU campuses are separated by about two hours, but this rivalry doesn’t receive the sort of national acclaim as other series between relative neighbors. The hard hitting in the early-going gave a different impression, that these teams were fired up to face each other. The biggest check was laid right in front of the OSU bench by Miami’s Curtis McKenzie—who would later score the RedHawks’ goal. • One could argue the biggest play of the night came in the game’s eighth minute. Most of the contest to that point had been played in the OSU defensive zone, but the Buckeyes’ first two shots on net came in rapid succession and were turned away by the left pad of Miami goaltender Jay Williams. The second save was an outstanding stop with Ryan Dzingel, Ohio State’s top scorer, looking certain to bury a rebound with his backhand. • Instead of Ohio State claiming some early momentum, the game was scoreless through two periods before OSU defenseman Devon Krogh threw a puck at the net that slipped through Williams at 3:52 of the third. Williams had to deal with a screen from his own defenseman, and it wasn’t the type of goal you’d expect from a goalie who entered having lost just twice in his first 12 collegiate decisions. When you’re as good as he was the rest of the night, you can afford to let one slip in. Williams finished with 22 saves and stopped all three OSU shots in the shootout, including an outstanding right-pad save on Alex Szczechura’s backhander to start things off. • Ohio State’s Brady Hjelle was great on the other end, logging 28 saves. The one that got by him was a pretty power-play tally to tie the game with 7:17 left on the clock. McKenzie flashed to the slot, took a pass out of the corner from Riley Barber and buried a wrist shot. It looked like the RedHawks might build on that lead, but Hjelle made huge saves on an open Alex Wideman and the rebound-ready Marc Hagel and the Buckeyes then survived a dominant shift from the McKenzie-Czarnik-Barber line. • Here’s hoping that this rivalry gets even stronger after next season’s conference realignment. I think it could. There will be a great deal of chirping between fans of the Big Ten Conference and National Collegiate Hockey Conference, and this could be a key head-to-head fixture in the race for league bragging rights. • This one was pretty straightforward. The visiting Broncos played the solid, mistake-free game of a top-10 team that had won each of its previous five games. The Wolverines seem to have regressed significantly since I last watched them play in mid-November against Notre Dame, a theory supported by their winless record since Thanksgiving. Against the Irish, Michigan played well against a good team and was in both games until the end. That was not the case Friday, when Western turned Michigan miscues into a 3-0 by the time the second period was six minutes old. Phil Di Giuseppe’s goal energized the home team, and the Wolverines outshot the Broncos 13-3 in the final period, but power-play struggles sunk any comeback hopes. • The Wolverines’ power-play trouble started early. They couldn’t capitalize on an early WMU penalty and, after falling behind on a bad goal, desperately needed to score on a 74-second, two-man advantage. Instead, the Broncos penalty killers did not allow a shot and had a breakaway chance of their own during the sequence. Michigan also got two power plays after cutting the WMU lead to one goal but could convert neither and finished the game scoreless in 23 straight power plays. • Western Michigan, in addition to 5-for-5 penalty killing, was 1 for 5 with the man advantage for its seventh power-play goal in the last five games. The power-play marker came in the final minute of the first period, trickling under the arm of Michigan goaltender Steve Racine. • The third WMU goal was no fault of Racine’s. A bad change by the Wolverines resulted in a three-on-one break from the blue line in for Western. CBS Sports Network analyst Dave Starman said that WMU coach Andy Murray was looking for scoring depth, and each of the team’s non-empty-net goals came from a player who had not yet scored this season: Ben Warda, Luke Witkowski and Justin Kovacs. • Another bad change for Michigan led to a too-many-men penalty, but Western could not capitalize. Di Giuseppe then got the Wolverines back in the game by roofing a shot from the right side after an outstanding shift of forechecking by he and linemates Boo Nieves and Luke Moffatt. Michigan had been outshot 23-10 before scoring but had a chance to draw within one on a power play less than a minute later, but Western again came through on the penalty kill. • WMU goaltender Frank Slubowski registered 23 saves, but he had some help. One great defensive sequence came with about five minutes left, when left wing Trevor Elias went down on his knees in the slot to block a slap shot from point-blank range and seconds later made himself as big as he could to knock down a point shot. He will likely receive star treatment in the Broncos’ Saturday video review. • The teams meet again tonight, and despite Friday’s performance, the Wolverines have another chance to turn things around against a good team. • Toronto Maple Leafs general manager Brian Burke joined the CBS Sports Network broadcast for a few minutes at the start of the second period. When asked about the biggest changes in college hockey in recent years, he replied, “The older age of the players is probably the biggest change. You have better players if they’re a year older or two older. I’m not sure I like it from a developmental standpoint.” Actually, he sounded very sure that he doesn’t like it. And he’s not alone. There are many around college hockey who think that the trend of sending players to juniors for a year or two before bringing them to campus is a disservice to prospect of a level playing field and even to the college experience. From Burke’s perspective, pro teams have to wait long enough to get their hands on college prospects and would prefer not to add to that time. Of the six teams set to play in the Big Ten next year, Minnesota has clearly been the best. No surprise there. What’s interesting is that Ohio State has been an obvious No. 2, and Penn State has proven far more competent than one would expect from a first-year varsity team. My thought from the outset of the Big Ten secession announcement has been that those two teams, while perhaps improving overall, would struggle to dent the top four spots of the Big Ten, given the name-brand hockey schools against whom they will compete and recruit. However, the Buckeyes establishing themselves as a Big Ten force and the Nittany Lions contending from the league’s outset would go a long way to setting up a Big Ten hockey culture in which those schools are perennial factors instead of also-rans. • It was a night of near-misses on the uniform front. 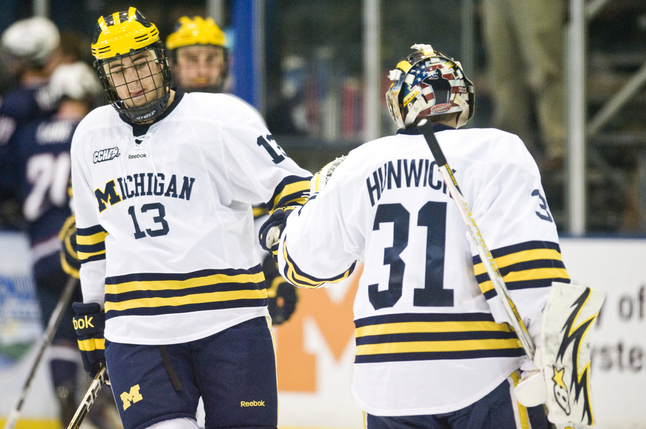 When Michigan introduced the first iteration of its current white jersey, it was the best in college hockey. Simple and gorgeous. Then last year they changed the M in “Michigan” to the block M used in the school’s athletics logo, creating an awkward, mismatched team name. The sweater is still a beauty, but that M pains me every time I see it. The white jerseys Ohio State wore last night are not my favorite in their arsenal, but I generally like their look. What’s tough to swallow, though, is that the hockey Buckeyes (unlike their football brethren) consistently mismatch the striping on their helmets with that on their jerseys. Just switch the locations of the white and gray stripes and you have a perfect match of gray-black-white-red-white-black-gray. 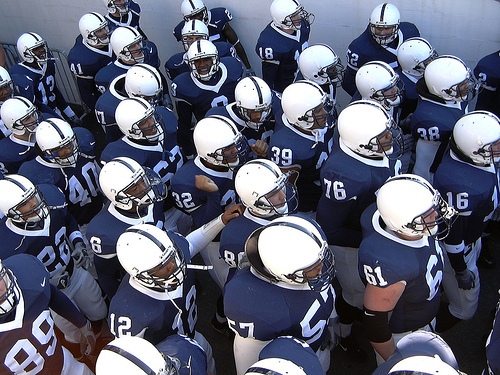 Ohio State could also learn a lesson on helmets from Penn State. The Nittany Lions follow the lead of Michigan and Ohio State with hockey-helmet striping that mimics their school’s football helmets, but the truncated stripe on the PSU lids looks much better and less forced than the Buckeyes’ thick striping that goes all the way down to the facemask. I do like the OSU hockey team following the football tradition of filling one side of the helmet with Buckeye reward stickers. This wouldn’t work for most teams, but it does for Ohio State.